Place the syrups and peanut butter into a small saucepan and whisk thoroughly to mix. Bring to a boil while stirring constantly. Reduce the heat to medium-low, stir or whisk frequently, and simmer for 10 to 12 minutes or until the syrup thickens and drips slowly from the spoon. Place the crispy cereal, dried fruit, seeds, and nuts in a mixing bowl. Pour the hot syrup over the mixture and mix thoroughly to coat all ingredients. Lightly moisten a glass baking dish with cold water. With moistened hands, place the mixture in the baking dish and press it down evenly and firmly. Place the dish in the freezer for 20 to 30 minutes, allowing the syrup to harden. 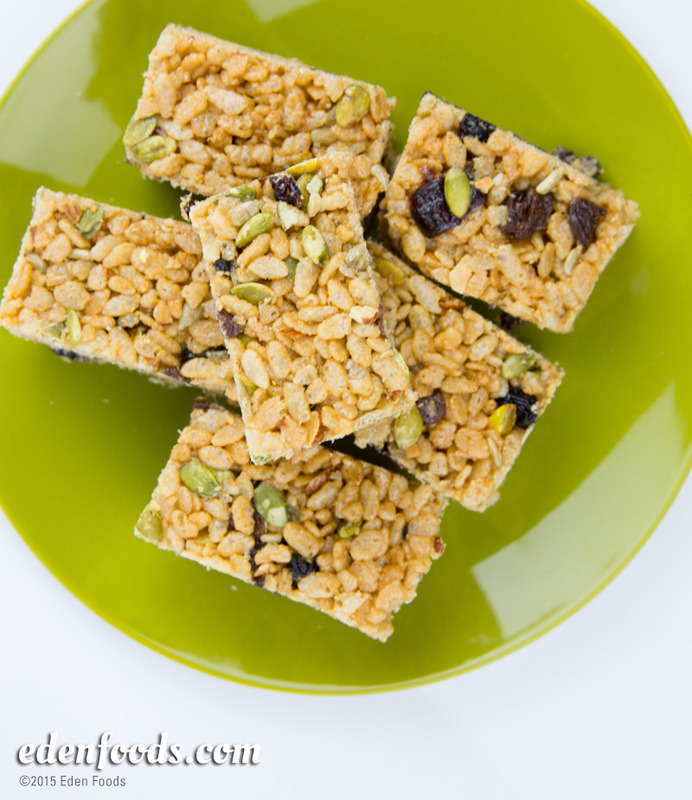 Remove and slice into bars or squares. Store in a covered container on the counter or refrigerate.